Oh it’s winter time. Honestly I love the winter. I love the cozy clothes, Netflix marathons, and of course curling up with a good book! 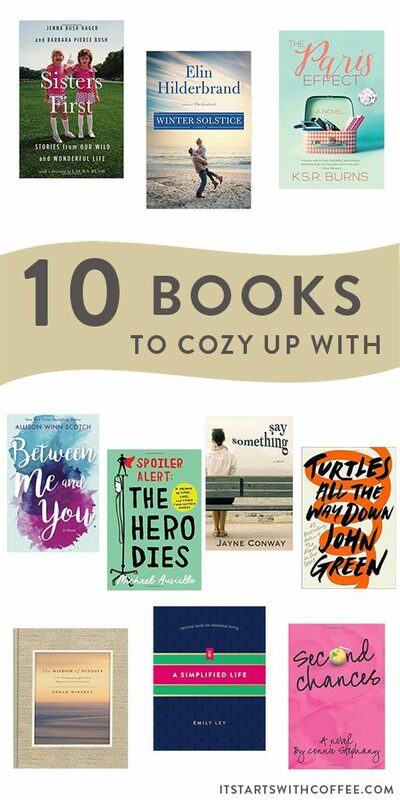 Today I am sharing with you guys 10 books to cozy up with. So if you have some downtime this winter, these are PERFECT! Sisters First by Jenna Bush Hagar and Barbara Bush was SO good! Politics aside it’s a great read about growing up in the political world and the bond they have with each other. Winter Solstice by Elin Hilderbrand is a new book from her that I really enjoyed. If you liked any of her other books you will love this! Perfect winter read! The Paris Effect was a super quick and enjoyable read. For sure a great escape book! I was sent an ARC of Between Me and You and I LOVED IT! One of my favorite books I’ve read in a while. It’s romantic, at times heartbreaking and exactly the kind of book you don’t want to end. I am a huge fan of Emily Ley and I loved her first book so I was pumped to read A Simplified Life. It’s really great for anyone wanting a less is more approach. The Wisdom Of Sundays is Oprah and Inspiration. Do I need to say more? You know John Greene he wrote The Fault in Our Stars. While I realize Turtles All The Way Down is not a super adult book it’s still pretty good and while it isn’t my favorite of his I did really like it. True story, I wanted to read Say Something because I judge books by their cover. It did not disappoint. I preordered Spoiler Alert The Hero Dies MONTHS AND MONTHS before it came out. I love Michael Ausiello and I have read his colums for years. This is so heartbreaking but he is a beautiful writer and you can tell just how much writing this meant to him. Highly highly suggest! Second Chances is a really fun read of what could have been. It was really enjoyable. Do you have any books to cozy up with to share? If you are looking for other book suggestions check out my books page! Oh I love Elin Hilderbrand! I’m definitely going to have to check out Winter Solstice. Thanks for all the great recommendations to add to my reading list! I need to go check out A Simplified Life! I have lots of decluttering to do, haha. im heading to the library in a bit…this came at the right time. Say Something and Spoiler Alert look fantastic! I got my sister an E copy of Sister’s First for Christmas. Can’t wait to see what she thinks. I’d love to read it myself also! I’ve been wanting to read Sisters First! 🙂 Great list!! Oh, I’m surprised I haven’t read any of these, so I’m happy I have some new books to look out for! I am really curious about The Hero Dies. And I LOVE John Green, so Turtles WILL be read soon – my favorite by him is Looking for Alaska. The Paris Effect grabbed my attention right away. I think I need to grab that book. It feels like so long since I got stuck into a good book! Thanks for the recommendations… need to find a time slot to do this! !